EVERY MONDAY IS €12,00 BURGER NIGHT! Angus Beef Burger / Beetroot, Chickpea & Lentil Burger. all burgers come with a complimentary house beer, house wine or house soft drink! BARGAIN!! Most times you have to choose between a nice coffee bar and a refined restaurant. Drover's Dog has got both! 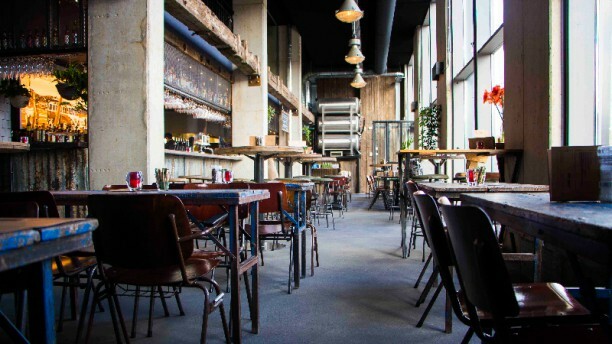 This Australian gourmet cafe brings the laid back Australian vibe to Amsterdam. Nonchalant perfection is perhaps the most accurate description if they serve you a hamburger on the board. The easy interior of robust wood, an Eastern rug and some uncomplicated plants and flowers is the cherry on the pie! Metro 51, 53 en 54, station Wibautstraat. Incredibly welcoming staff, good atmosphere and even greater food. Loved it all, as usual. Our favorite restaurant in Amsterdam ever since we first came here (almost 2 years ago). Love the atmosphere, food is always great and for a good price too. You can néver go wrong with their beef burger and even their side salad is delicious. We always ask for greens/salads instead of buns/chips and this has never been an issue, they always substitute the carbs for a great alternative. We had a great night with a big group of about 25 persons. The staff was very accommodating, the food was great and the service quick. Would definitely recommend. If you go, don't miss out on the bloody mary w/ bacon infused vodka! They make absolutely the best burgers and fries that are in a gourmet level and I am in love with it! We loved our fork discount and we will definitely visit the restaurant 2 more times in the upcoming days. Always a pleasure to eat here. The vegetarian burger with chips does the trick. Nice restaurant, I can recommend. Wonderful meal, atmosphere and service. We have already booked to come back, and we will be recommending to friends and family. Thank you. Great Restaurant. Cool decore. The Roo was ace and left us chockers. The Drovers Grog beer is a nice drop! Looking forward to going back again!!! It is one of our favorite local place, great food, extremely friendly staffs with great owners and services. Their menu offers variety of selection suitable for both adult and children. Drovers Dog reflects the beauty of Amsterdam because the audience are always a mixture of Dutch and international people. Great food. Good glasses of wine. Nice staff. Salad was great and loved the way how they present their desserts. Already went back the next day after. Very nice evening. The steak was a bit tough. But everything else was yummy. Great atmosphere. Service was terrific. This review required some additional characters, so here they are. Starters took an hour to arrive. Not enough staff, The service was polite and helpful, but we did have to go and look for a waiter 3 times. I had to keep my coat on , we were not aware that we would be sitting in a draft all night. The calamaris was diced exceptionally small , more batter than fish. and far too much salt used. The cod and chips was one of the best that I have had in Amsterdam , but the desserts offered were just a small slice of cake. Thanks for the feedback. Sorry to hear that your experience was not such an enjoyable one.. Yes we were one staff member down that evening. The squid that we use are chipirones, but we are experimenting with a new squid so when you return I be more than happy for you to be the judge and let me know what you think! Glad you enjoyed the fish n chips! Thanks for the review Alex! Hope to see you guys again soon! I really enjoyed the experience and the menu. Food was high quality and the service was great. Good to have a little piece of Oz in Amsterdam. Thanks for the great review mate! Hope to see ya again soon! Erg aardige bediening, lekker eten en mooie tent. An amazing place to eat and or have a drink. Love the wonderfull service and the food is really great. Love ecergtbing abou Drovers Dogg. Second time for me to eat and drink there. Just love the staff. I wouled recomened it to everyone.